Share 4G & 5G LTE Technology and Latest Gadgets, Enjoy Amazing Speed with LTE Broadband! With the development of the LTE network, Vodafone offers a new 4G/LTE mobile WLAN hotspot R230. The R230 pocket router supports speeds of up to 450 MBit/s in the downlink and up to 50 MBit/s in the uplink (LTE category 9) and is manufactured by the Chinese manufacturer ZTE. For a fast connection to wireless and wired devices, there are dual-band Wi-Fi and USB 3.0. With the unlocked Vodafone R230, users can use it with any SIM cards in Europe and take it for global travel. The Vodafone R230 is the successor to the Vodafone R226 LTE hotspot in the product range. Improved mainly the maximum downlink speed in the LTE network, further improvements are minimal or barely noticeable. The Qualcomm Snapdragon X12 LTE chipset in the Vodafone R230 hotspot can technically reach up to 450 MBit/s in the downlink and up to 50 MBit/s in the uplink, but Vodafone Germany only advertises the device with a maximum download speed of 375 MBit/s. The following LTE frequency ranges are supported: 800 MHz, 1400 MHz, 1800 MHz, 2100 MHz and 2600 MHz. Of course, the Vodafone R230 router can also support UMTS/3G and GSM/2G networks, in the UMTS network, up to 42.2 MBit/s in the downlink and up to 5.76 MBit/s in the uplink are reachable. In the UMTS network, the bands are supported by 850, 900, 1900 and 2100 MHz, in the GSM network the bands can be used at 850, 900, 1800 and 1900MHz. On the front of Vodafone R230, you will find a small color display, on which the most important information about the Internet connection and device status are displayed. These include, for example: reception status, mobile phone technology, WLAN status and used data volume. 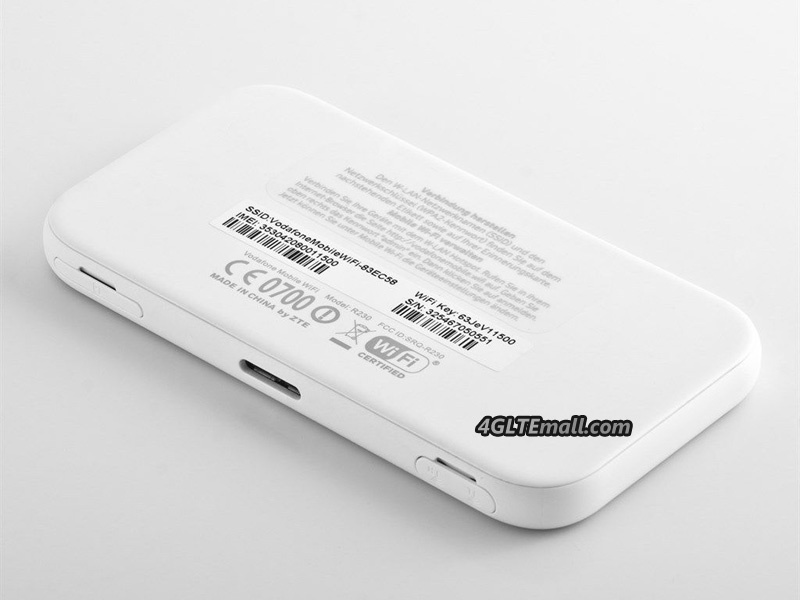 On the side of the R230 MiFi, in addition to the USB port for charging the battery, there is also the slot for the SIM card as well as two connections for an external antenna. On the other hand, there is a power button and a function button. The battery has a capacity of about 2,200 mAh and is not changeable, according to Vodafone, the R230 provides an operating time of about 10 hours. The WLAN works both on the 2.4 GHz frequency band and in the 5 GHz frequency range. The WLAN standards 802.11b/g/n/ac are supported, ie the fast LTE Internet connection should also arrive at full power at a connected terminal. As an alternative to WLAN, a USB 3.0 port can be used. The approximately 105 gram is very light, which makes it very easy to take in hand or pocket. The Vodafone R230 LTE hotspot comes pre-installed with Vodafone software and is offered by Vodafone in conjunction with the DataGo data plans. It’s a customized hotspot from the ZTE MF980 4g mobile hotspot. We can provide the unlocked Vodafone R230 without the data plan. You can get unlocked R230 and use it with any network providers’ SIM cards in Europe. 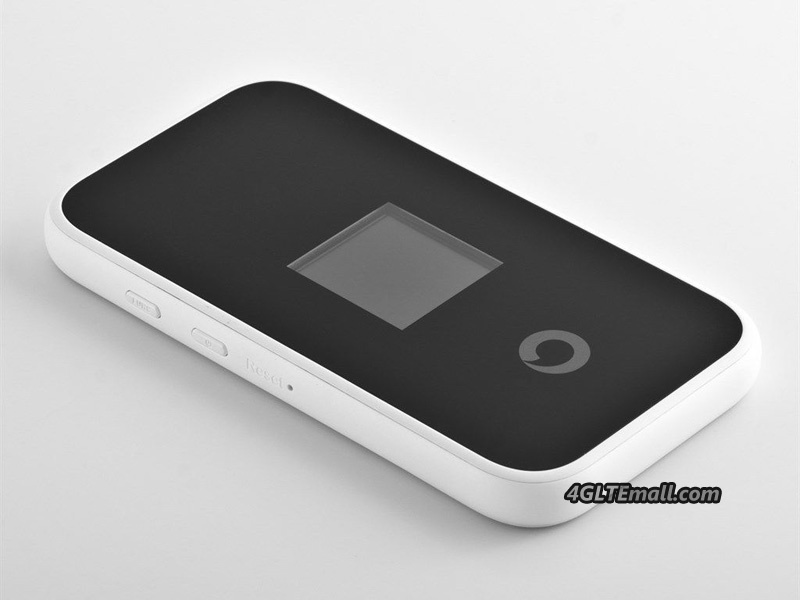 The unlocked Vodafone R230 would soon be available on www.4gltemall.com. We will keep updating the news. If you prefer the pure R230 without Vodafone customization, you can choose the factory model ZTE MF980 UFi, which has same specifications and functions.